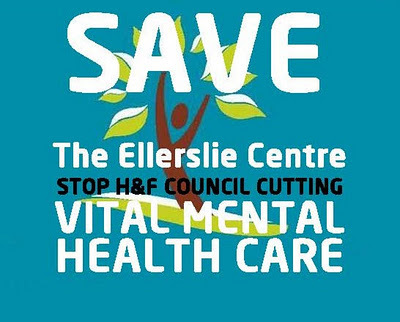 For many years now, the Ellerslie Centre has offered some truly excellent day services that have proved critical to supporting people with enduring mental health needs. H&F Conservatives are looking to curtail these services and move in other community groups which they intend to evict from other council buildings they are planning to sell off. The users of Ellerslie Road are devastated and upset. This process has reached the “consultation” stage which I encourage people to take part in by clicking here. Hammersmith and Fulham Conservative Administration have built a reputation of never doing a consultation unless they have already decided what they want the outcome to be. So at the last Select Committee (click on link and see page 84) meeting on 5th November many users of these services expressed an understandable cynicism about the consultation process. I must say I didn’t find the evidence presented by the council officials leading on this to be in any way convincing. “This isn’t being driven by building sales” was offered up early on as a particularly hard to believe assurance about these service changes. Instead, we were told that the numbers of users had mysteriously dropped off despite their best efforts to encourage people to attend. So I asked the officials if it was true they had stopped referring people to the centre last year? “Er, yes… that did happen” came the answer. I enquired how long that was for “I’m not sure” came the nervous response concluding with “I think it was about three months.” I thought it was peculiar that the officials hadn’t mentioned that in their presentation. You put the lunch prices up as well didn’t you? I asked. “Yes we did” came the response. They went up from £1 to nearly £4 a lunch or from £7 a week to nearly £24 a week. "Would that deter people from attending?" I asked? The forty or so users of the centre in the audience shouted "Yes!" One in four of us will suffer some type of mental health issue during our life times. If that happens our eating, hygiene and day-to-day communication habits may all deteriorate. And so when people are on the way back up it’s places like the Ellerslie Centre that are there to help with the lifting providing an affordable hot meal, laundry and washing facilities and expertly trained staff. It appeared to me that the Council has been purposefully been running a policy of trying to cut the numbers of users attending this service. That in itself then allows them to justify the cut, then move in other groups and sell off the other buildings. At the Select Committee, Cllr. Joe Carlebach (Con), H&F's Cabinet Member for Community Care, asked us all to believe that this is just a consultation. I asked him what would he do if the answer came back saying, "No thanks." He prevaricated but despite that, I suggest we take him at his word his word, print it out and send back our views. We’ll see what he does with that at the next Select Committee meeting on 18th January 2012.